Note: If you are looking for a saas based helpdesk system, then you can refer our Magento 2 UVdesk Helpdesk module. Allow creating ticket status, ticket priority, ticket types, ticket custom field. Allow merging the multiple tickets into a single ticket. Allow splitting the single ticket into multiple tickets if a ticket is too big to manage. Allow managing and creating an unlimited number of customers. Allow managing and creating an unlimited number of agents. Allow creating organization and manage tickets based on the organization level. Allow managing and creating multiple agents and agent level. Admin managing and creating unlimited agent group. Admin defining business hours and holidays based on SLA’s. Allow managing and creating predefined responses with action. Allow managing and creating support center for the customer. Support manual and automatic ticket mails fetching. 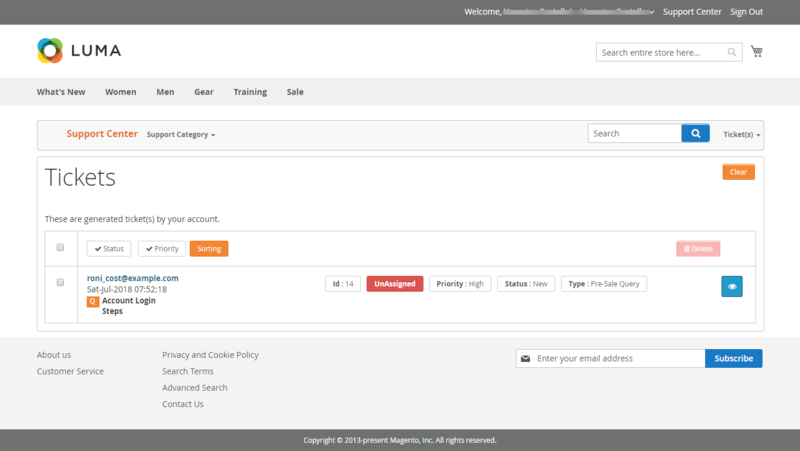 Configure email piping ie; the customers can reply directly from the ticket system without login to their inbox. Allow managing and creating multiple Service level agreements (SLA). 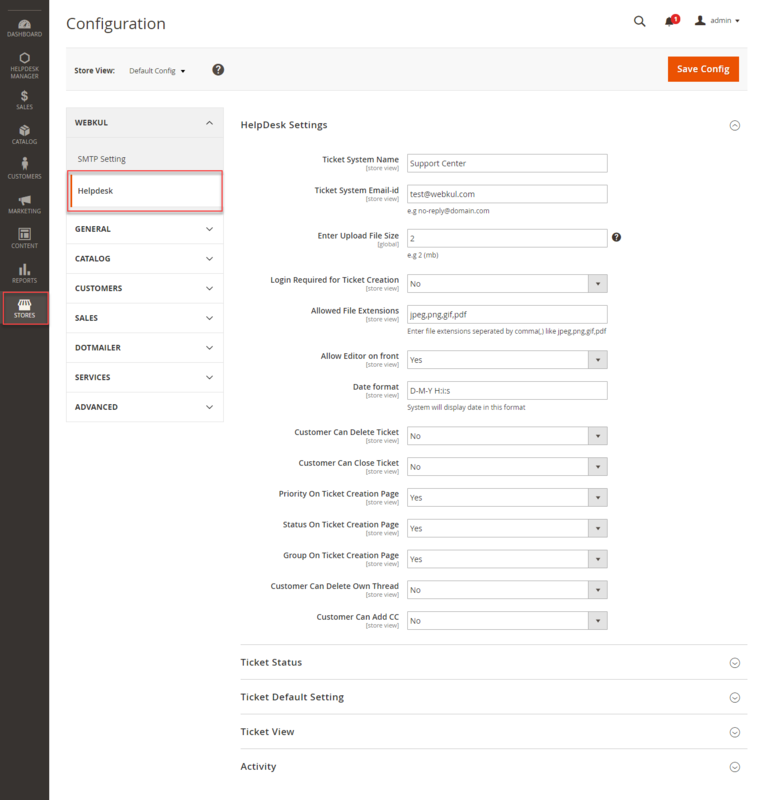 Easy settings to define and trigger the multiple actions in response to the event occurs in the helpdesk system. 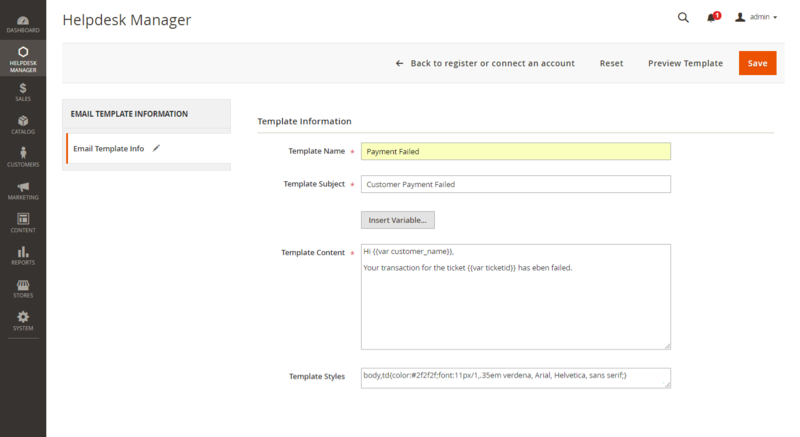 Can create the custom attribute for the ticket page to get additional data & information from the customers. Flexible settings for creating roles and ACL system(access control list). 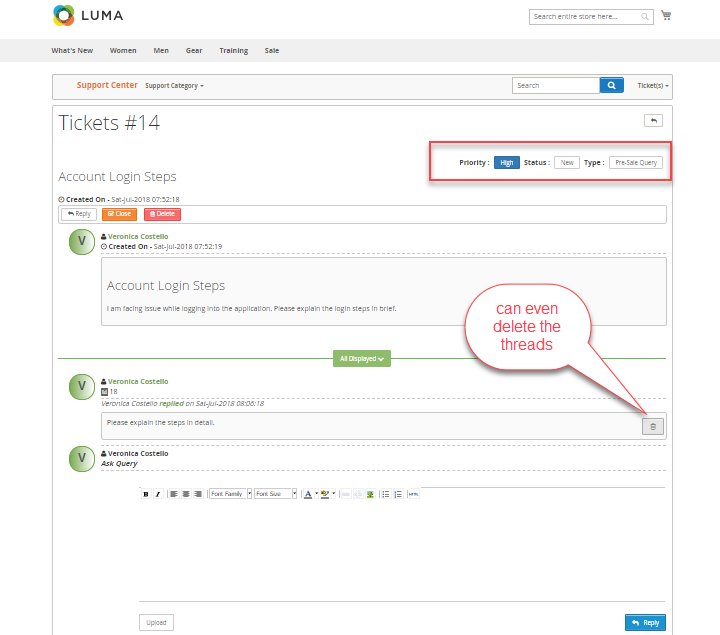 Support ticket lock feature to check who all are accessing a particular ticket. Working with all the templates including responsive themes. The source code is open so it can easily be customized. The customers will get a zip folder and they have to extract the contents of this zip folder on their system. The extracted folder has an src folder, inside the src folder you have the app folder. You need to transfer this app folder into the Magento2 root directory on the server as shown below. After the successful installation, you have to run the below-mentioned command in the Magento2 root directory. 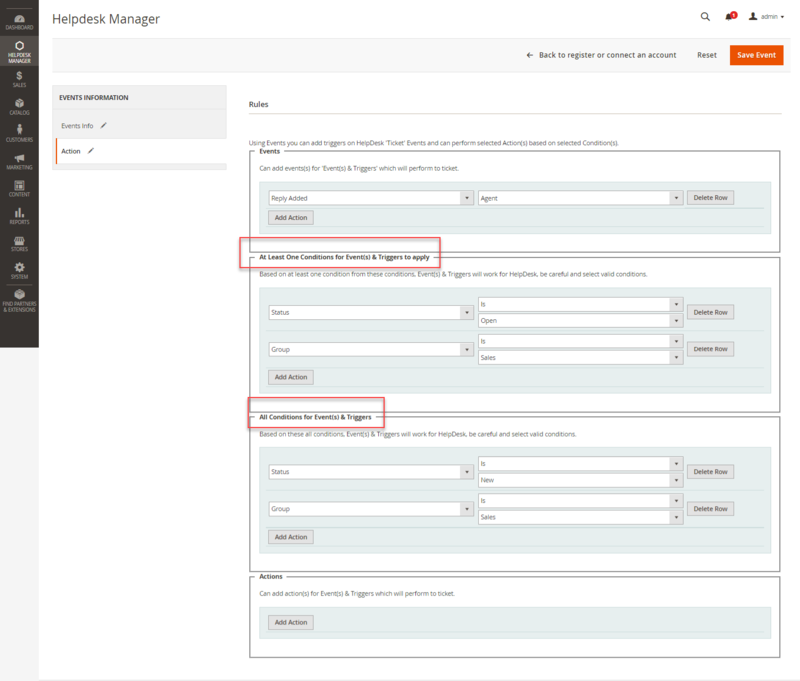 After running the commands, you have to flush the cache from the Magento admin panel by navigating through->System->Cache management as shown below. For Multilingual support, please navigate to Store>Configuration>General >Locale Options. And select your desired language from the Locale option. If you need to do the module translation, please navigate to the following path in your system app/code/Webkul/Helpdesk/i18n. Open the file named en_US.CSV for editing as shown in the below screenshot. Once you have opened the file for editing. Replace the words after the comma(,) on the right with your translated words. After editing and translating the CSV file, you need to save the translated file name according to your region language and country code such as – de_DE.CSV. Then upload the translated file to the same folder from where you have obtained it. Now your module translation is complete. After the installation, the admin will configure the module settings. For this, the admin will navigate to Stores ->Configuration -> Webkul -> Helpdesk as per the below image. Ticket System Name: Set the name for the ticket system. Ticket System Email-Id: Set the email i.d for the ticket system from which the emails will be sent. Enter Upload File Size: Define the file size to be uploaded by the customers. Login Required for Ticket Creation: If set as YES then customer have to log in to their accounts and then can generate tickets. If set as NO then any customer can generate ticket without logging into the helpdesk. Allowed File Extensions: Define file extension to be uploaded by the customers. Allow Editor on front: If set to YES then the customer can use the editor. Else set as NO then customers can’t use the editor. Date Format: Set the date format so that the Helpdesk will display dates in this particular format. Customer Can Delete Ticket: If set to YES then the customer can delete their ticket. Else set to NO to restrict the customer from deleting their ticket. Customer Can Close Ticket: If set to YES then the customer can close their ticket. Else set to NO to restrict the customer from closing their ticket. 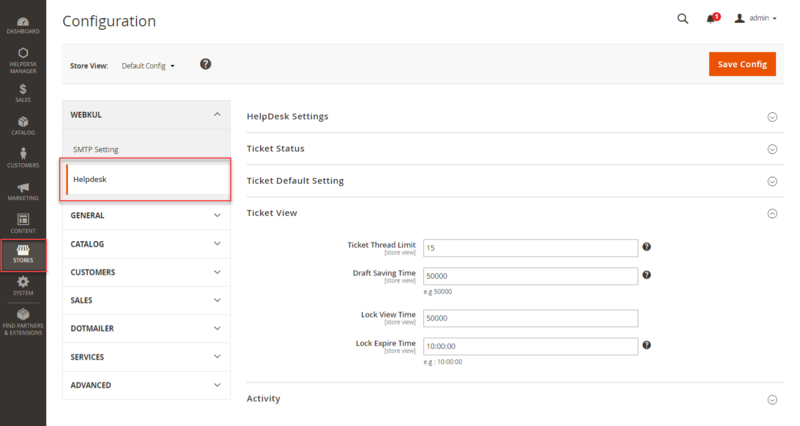 Priority On Ticket Creation Page: If set as YES then the ticket priority field will be displayed on the ticket creation page which the customer can update while creating the ticket. Else set as NO to restrict the display of ticket priority field for the customers on the ticket creation page. Status on Ticket Creation Page: If set as YES then the ticket status field will be displayed on the ticket creation page which the customer can update while creating the ticket. Else set as NO to restrict the display of ticket status field for the customers on the ticket creation page. 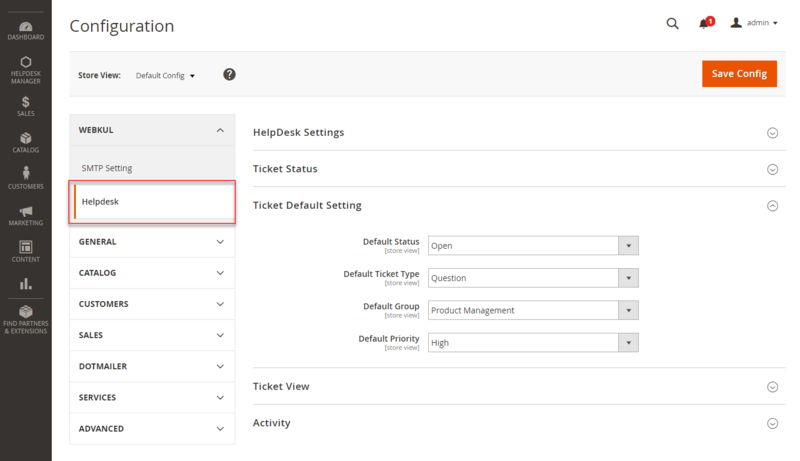 Group On Ticket Creation Page: If set as YES then the ticket group field will be displayed on the ticket creation page which the customer can update while creating the ticket. Else set as NO to restrict the display of ticket group field for the customers on the ticket creation page. Customer Can Delete Own Thread: If set to YES then the customer can delete their own thread in the ticket. Else set to NO to restrict the customer from deleting their own thread in the ticket. Customer Can Add CC: If set to YES then the customer can add collaborators in their ticket. Else set to NO to restrict the customer from adding collaborators in their ticket. Ticket Open: Configure the ticket status when the ticket is open. Ticket New: Configure the ticket status when the ticket is new. Ticket Pending: Configure the ticket status when the ticket is pending. 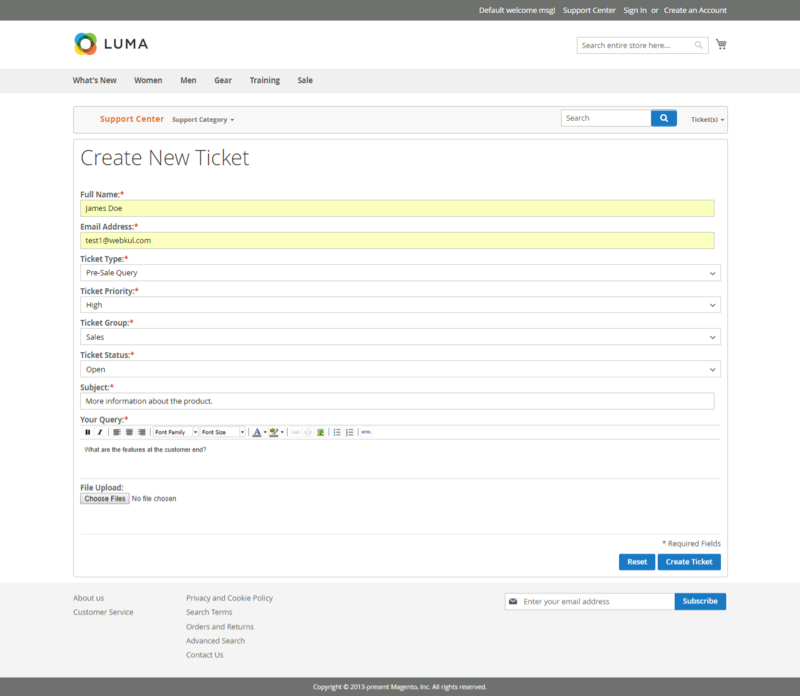 Ticket Solved: Configure the ticket status when the ticket is solved. Ticket Closed: Configure the ticket status when the ticket is closed. Ticket Spam: Configure the ticket status when the ticket is spam. Default Status: Configure the default ticket status when the status of the ticket is not defined. Default Ticket Type: Configure the default ticket type when the type of the ticket is not defined. Default Group: Configure the default ticket group when the group of the ticket is not defined. Default Priority: Configure the default ticket priority when the priority of the ticket is not defined. Ticket Thread Limit: Define the ticket thread limit. e.g-1,2,3 etc. So that the customers can view the configured number of threads in the ticket. And if they want to see all the threads they can expand it. Draft Saving Time: Set draft saving time. So that whenever any agent or admin will be typing a message it will automatically get saved after that specified interval of time. Lock View Time: Configure the lock view time. Lock Expire Time: Configure the lock expire time. Activity Limit Dashboard: Limit the number of activities to be shown on the dashboard. The activities are the actions performed by agents or admin on the tickets like- status change, priority change etc. Generate Activity: Select the items from the list for which the activity to be generated. Activity Priority on delete: Set activity priority on deleting a particular ticket. 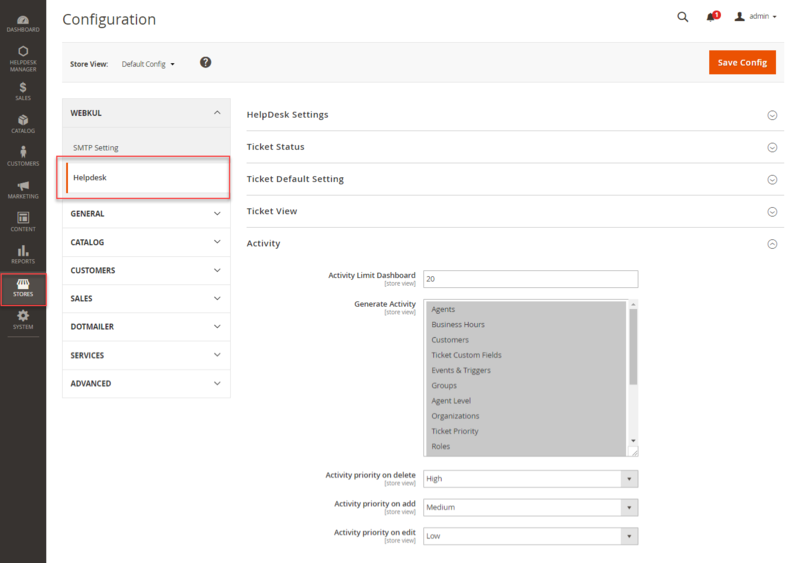 Activity priority on add: Set activity priority on adding a particular ticket. Activity priority on edit: Set activity priority on editing a particular ticket. 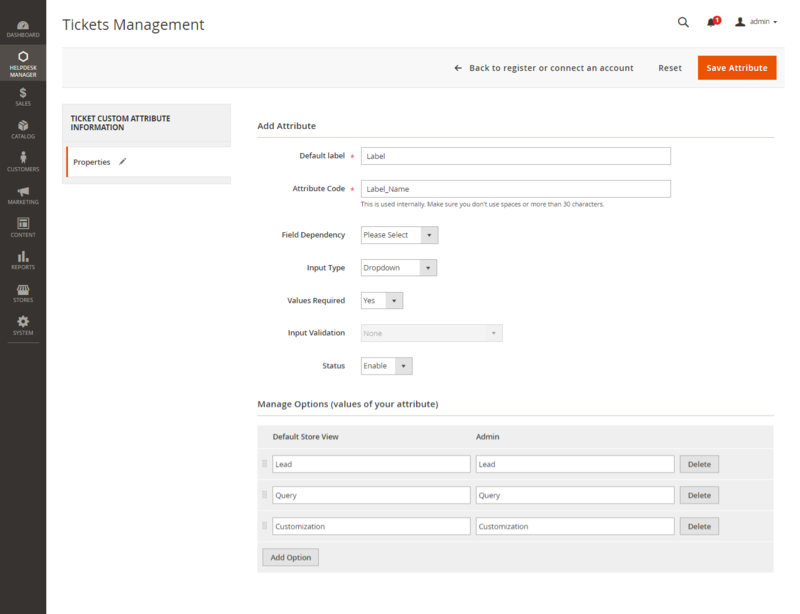 Once the admin is done with the module settings, the admin will have a Helpdesk Manager menu option as per the below image. Here, the admin will have several sub-menu options to manage the helpdesk system which we will discuss them one by one in detail. Dashboard: This is the dashboard of the ticket system which will display the tickets by the respective ticket’s status separately. Ticket Management: This section is to manage the tickets. Agent Management: This section is to manage and create the new agents who will handle the tickets. Customer Management: This section is to manage the customers who have created the tickets. Reporting: This section is to view the complete report summary of the customers and the agents. 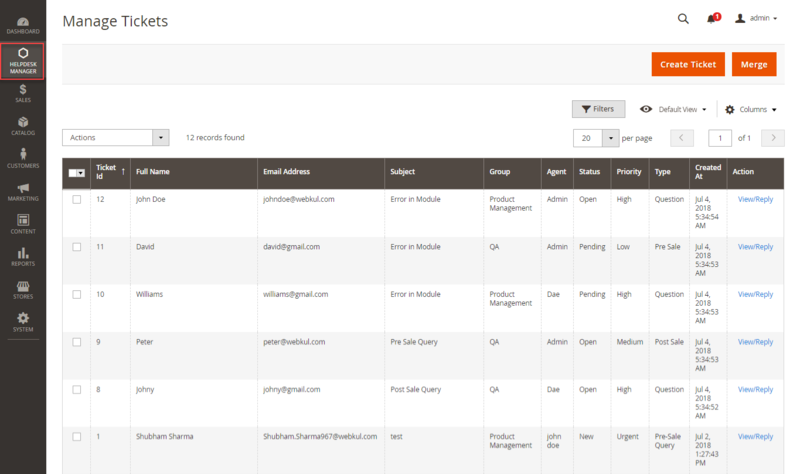 To view the dashboard, the agent will navigate to Helpdesk Manager -> Dashboard as per the below image. On the top, the agent can view the tickets by the respective ticket’s status separately. This will helps the agent to get the detailed statistics about the tickets. And under “Recent Activity” section, the recent activities performed by the admin/agent will be displayed. It will display the limited activities configured by the admin. Suppose the admin has configured 5 activities in the backend, then it will display only 5 most recent activities on the dashboard. So the older activities will get deleted automatically if the new activity occurs. And, can click on the icon to view the agent details like name and email address as per the below image. 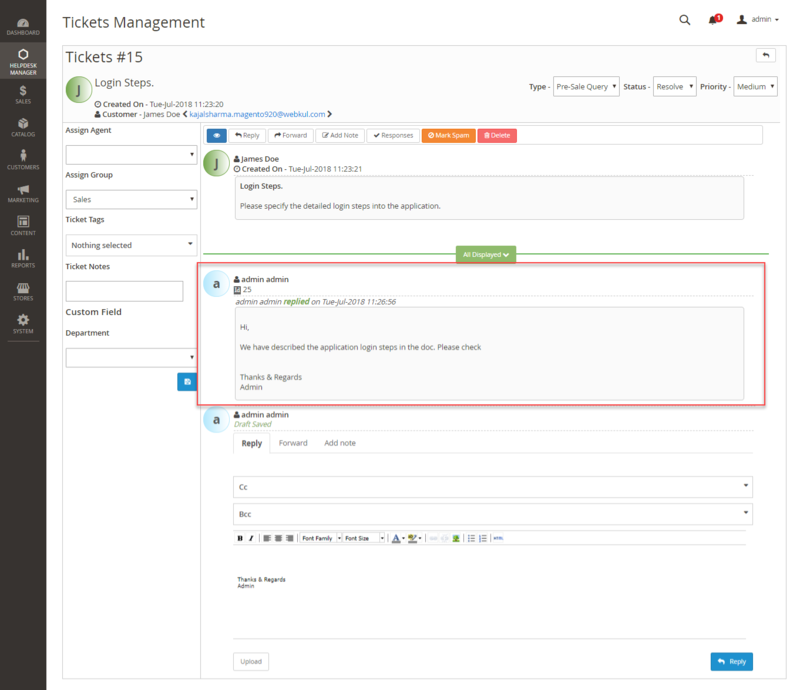 The agents can easily manage tickets in the helpdesk system by navigating to Helpdesk Manager -> Manage Tickets as per the below image. Here, the agent can easily change the ticket status, type, priority, group, agent and can even delete the ticket. For this first, select the tickets which the agent wants to update. Then, click on Action and select the action type from the drop-down which the agent wants to perform on the selected tickets. After submitting the selected action, the ticket gets updated. Here, the agent can create new tickets on the behalf of customers. For this, the agent needs to click on Create Ticket button as per the below image. Clicking on Create Ticket button navigates the agent to the New Ticket page as per the below image. Customer Name: enter the customer name on whose behalf the agent will be creating the ticket. Email: enter the customer email address. Type: enter the ticket type. Subject: enter the subject of the ticket. Query: enter the customer query. And lastly, save the ticket details by clicking the Save Ticket button. The agent can even merge the multiple tickets. For this first, select the tickets which the agent wants to merge. Then, click on Merge button and a pop-up will appear. While merging the multiple tickets one ticket will set as the primary ticket which the agent can even change as per the choice. For changing the primary ticket, simply check the checkbox of the ticket which the agent wants to set as the primary ticket. The agent can also remove the ticket from merging by clicking the blue cross button. And lastly, click on Merge button to merge the tickets. The agent will click on the View/Reply link to view or add a reply to the ticket. Reply: reply tickets from this screen. Add cc/bcc: add cc bcc recipients if enabled from backend option. Forward: forward the ticket by clicking on the forward button and the ticket content will appear in the reply text field. Ticket note: This ticket note can be added by one who will be working on the ticket. Admin/Agent can add a note for future references. Ticket tags: This ticket tag can be added by the one who is working on the ticket. Tags help the Agent/Admin to search the tickets in future using filters. Lock view: This feature indicates one or more agent is viewing that particular ticket.If only one agent is viewing that ticket then the marker will be blue and if more than 1 agent is viewing that ticket then the marker will turn red and show a pop-up with the name of the other agent working on that ticket. Add note: add an internal note to the ticket which will be visible to the agents only. Mark spam: mark the ticket as spam by clicking mark spam button. Delete: delete ticket by clicking on delete button. Response: choose a response from the list of responses which have made earlier in the ticket.The response will include various actions like-Group update, Priority update, reply added, etc so that it will be easy for the agents to add a response to a ticket. Split: break the single ticket into multiple tickets if a ticket is too big to manage. The agent can manage and add the multiple new ticket types. View the complete list of existing tickets types. Edit any ticket type by clicking on Edit link. Update Status or Delete any ticket type from the Action drop-down list. Add new ticket type by clicking on the Add Type button. For adding the new ticket type, the agent will click on the Add Type button. This will navigate the agent to the “Ticket Type” page as per the below image. Name: enter the name of the ticket type. Description: enter the description of the new ticket type. Status: set the status as enable/disable of ticket type. And lastly, click on Save button to create the new ticket type successfully. The agent can manage and add the multiple new ticket status. View the complete list of existing tickets status. Edit any ticket status by clicking on Edit link. Update Status or Delete any ticket status from the Action drop-down list. Add new ticket status by clicking on the Add Status button. For adding the new ticket status, the agent will click on the Add Status button. This will navigate the agent to the “Add Status” page as per the below image. Name: enter the name of the ticket status. Description: enter the description of the new ticket status. Status: set the status as enable/disable of the ticket status. And lastly, click on Save button to create the new ticket status successfully. The agent can manage and add the multiple new ticket priority types. View the complete list of existing tickets priority types. Edit any ticket priority type by clicking on Edit link. Update Status or Delete any ticket priority type from the Action drop-down list. Add new ticket priority type by clicking on the Add Status button. For adding the new ticket priority type, the agent will click on the Add Priority button. This will navigate the agent to the “Add Priority” page as per the below image. Name: enter the name of the ticket priority. Description: enter the description of the new ticket priority. Status: set the status as enable/disable of the ticket priority. And lastly, click on Save button to create the new ticket priority type successfully. The agent can add ticket custom attribute to get additional data & information about the ticket from the customers. So, the agent can manage and add any number of custom attributes. 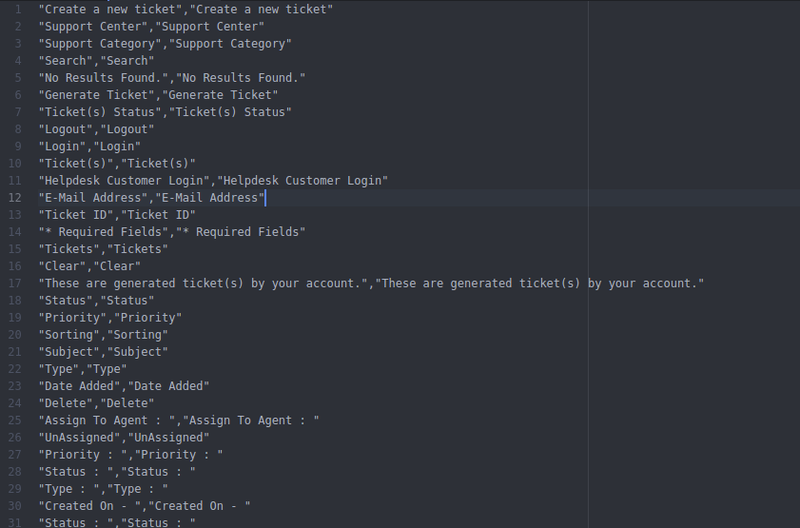 View the complete list of existing ticket custom attribute. Edit any custom attribute by clicking on Edit link. Manage the visibility of the custom attribute in the ticket or Delete any custom attribute from the Action drop-down list. Add new custom attribute by clicking on the Add Attribute button. For adding the new custom attribute, the agent will click on the Add Attribute button. This will navigate the agent to the “Add Attribute” page as per the below image. Default Label: enter the name of the new custom attribute. Attribute code: enter a code to the custom attribute. This code will be unique and can’t be changed further. Field dependency: create the custom attribute as the dependable field in the ticket. 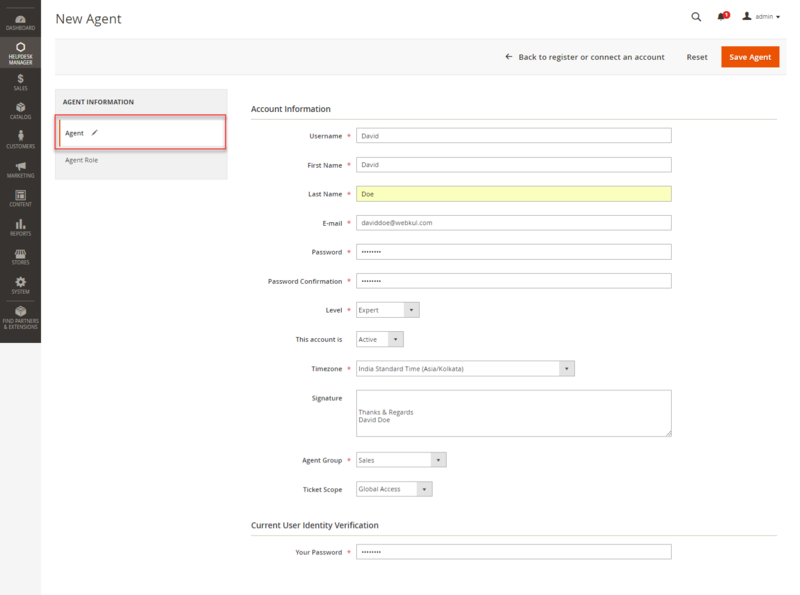 For this, simply select the parent field on which the custom attribute will be dependent. During dependable field, if the customer chooses an option and on the selection of an option, another field will be open up. If the agent doesn’t want to show it as a dependable field then just have to leave it blank. Input type: select the input type of the field. Values required: select YES to make this field mandatory and hence the values are required. Else select NO. Input validation: make validation to the data entered for the custom attribute. Status: set the status as enable/ disable of the custom attribute. Manage Options: create the options for the custom attribute if Input type selected as “drop-down” and “multi-select”. And lastly, click on Save button to create the new custom attribute successfully. The helpdesk system allows to manage and add multiple agents. These agents reply to the tickets assigned to them and in this way, one can manage a large number of tickets. View the complete list of existing agents. Edit any agent details by clicking on Edit link. Add new agent by clicking on the Add Agent button. For adding the new agent, the admin will click on the Add Agent button. This will navigate the admin to the “Add Agent” page as per the below image. Username: enter the username of the new agent account. First Name: enter the first name of the agent. Last Name: enter the last name of the agent. E-mail: enter the e-mail address of the agent. Password: set the password for the agent account. Password Confirmation: re-enter the set password to confirm it. Level: set the agent expertise level for managing the tickets like the expert, average, below average etc. This account is: set the agent account as active or inactive. Time Zone: set the time zone. Signature: configure the agent signature which will be visible in the ticket replies. Agent Group: configure the agent group. Ticket Scope: define the ticket access scope for the agent. Global access: In this, the agent will be able to access all the tickets of the helpdesk and can reply or edit any ticket. Group access: In this agent have the access to the tickets of every agent in a particular group. The agent can reply and edit any ticket of that particular group. Restricted access: The agents cannot access any ticket. Your Password: the agent who is creating the new agent needs to enter his own account password to confirm the identity. After defining the basic information, the agent will select the role type for the new agent so that agent can access those features only which the role includes. The agent can manage and add the multiple level types for the agent. View the complete list of existing level types. Edit any level details by clicking on Edit link. Update Status or Delete any level type from the Action drop-down list. Add new level by clicking on the Add Level button. For adding the new level type, the agent will click on the Add Level button. This will navigate the agent to the “Add Level” page as per the below image. Name: enter the name of the level type. Description: enter the description of the new level type. Status: set the status as enable/disable of the level type. And lastly, click on Save button to create the new level successfully. The system allows adding various groups for the tickets and agents. So that agents can see the tickets of their groups and can work on all those tickets. The agent can manage and add the multiple groups. View the complete list of the existing group. Edit any group details by clicking on Edit link. Update Status or Delete any group from the Action drop-down list. Add new group by clicking on the Add Group button. For adding the new group, the agent will click on the Add Group button. This will navigate the agent to the “Add Group” page as per the below image. Name: enter the name of the group. Description: enter the description of the new group. Status: set the status as enable/disable of the group. And lastly, click on Save button to create the new group successfully. The agent can manage and add the new customers. 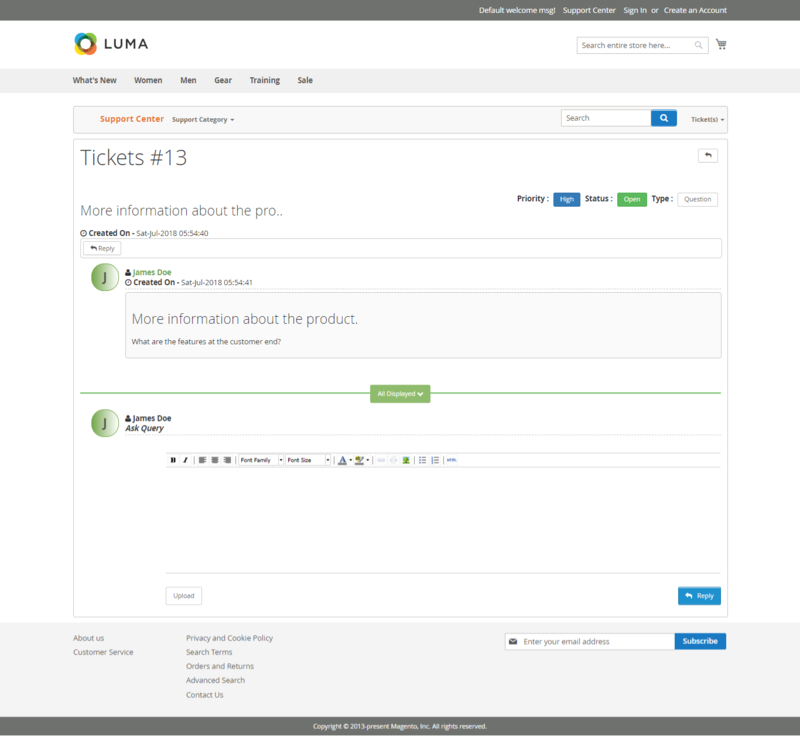 View the complete list of the helpdesk customers who have created the tickets. Edit any customer details by clicking on Edit link. Delete any customer from the Action drop-down list. Add new customer by clicking on the Add Customer button. For adding the new customer, the agent will click on the Add Customer button. This will navigate the agent to the “Add Customer” page as per the below image. Customer Name: enter the name of the customer. Email: enter the email address of the customer. Select Customer: select the Magento customer with whom the agent wants to map the new customer. This will merge the data of Magento store customer to the Helpdesk customer. Select Organizations: select the organization to put the customer in that organization. And lastly, click on Save button to create the new customer successfully. The agent can manage and add the multiple organizations for the customers. View the complete list of the existing organizations. Edit any organization details by clicking on Edit link. Delete any organization from the Action drop-down list. Add new organization by clicking on the Add Organization button. By creating the organizations, the agent can put customers in the different organization to which they belong. For adding the new organization, the agent will click on the Add Organization button. This will navigate the agent to the “Add Organization” page as per the below image. Name: enter the name of the organization. Description: enter the description of the organization. Domain: enter the organization URL address. Customer: Select the Magento customers the agent wants to put in the organization. 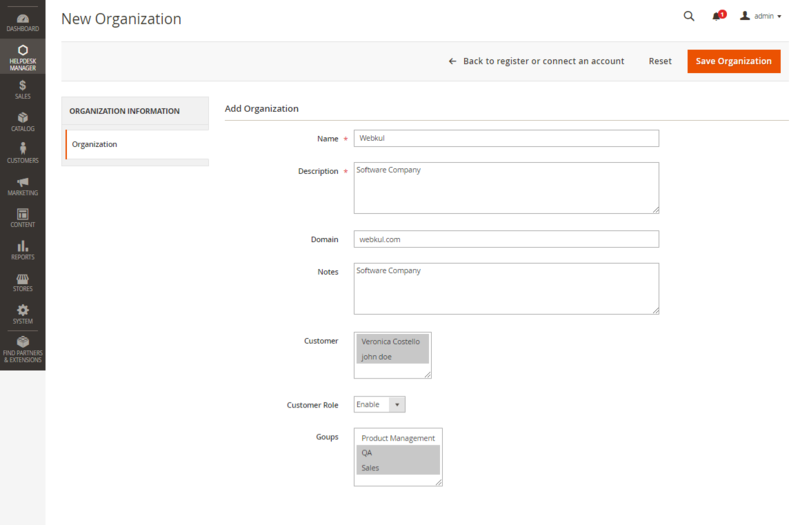 Customer Role: set the status as enable/disable of the organization. Groups: select the groups of the organization. And lastly, click on Save button to create the new organization successfully. The agent can manage and add business hours. Using business hours you can customize the work timings based on when you are actually working. The agent can also set up holidays as exceptions to the business hours set in their schedule. View the complete list of the existing Business Hours. Edit any Business Hours details by clicking on Edit link. Delete any Business Hours from the Action drop-down list. Add Business Hours by clicking on the Add Business Hour button. For adding the new Business Hour, the agent will click on the Add Business Hour button. This will navigate the agent to the “Add Business Hour” page as per the below image. Name: enter the name of the Business Hour. Description: enter the description of the Business Hour. Timezone: set the timezone for your business hours. After adding the basic info of business hour, the agent will add the actual working hours as per the below image. In this, the agent can define the working/non-working hours and also set working and non-working days. These details will be very much helpful for making and implementing SLAs. After defining the helpdesk hours, the agent can also add holiday list for the whole year. And lastly, click on Save button to create the new Business Hour successfully. Events are the activities which are performed on the helpdesk system by either customer or agent. Whereas triggers contain conditions and actions which are executed in response to the events occurred. The agent can define triggers like modify status, change priorities and even send out notification alerts as soon as certain event conditions are met. For example, a trigger – send mail to the customer can be set when a ticket status will be changed to close by the agent. View the complete list of the existing events. Edit any events details by clicking on Edit link. Delete any events from the Action drop-down list. Add events by clicking on the Add Event button. For adding the new event, the agent will click on the Add Event button. This will navigate the agent to the “Add Event” page as per the below image. Name: enter the name of the event. Description: enter the description of the event. Status: set the status as enable/disable of the event. After configuring the basic details of the events, the agent will define the action which will be triggered in response to the event occurs. 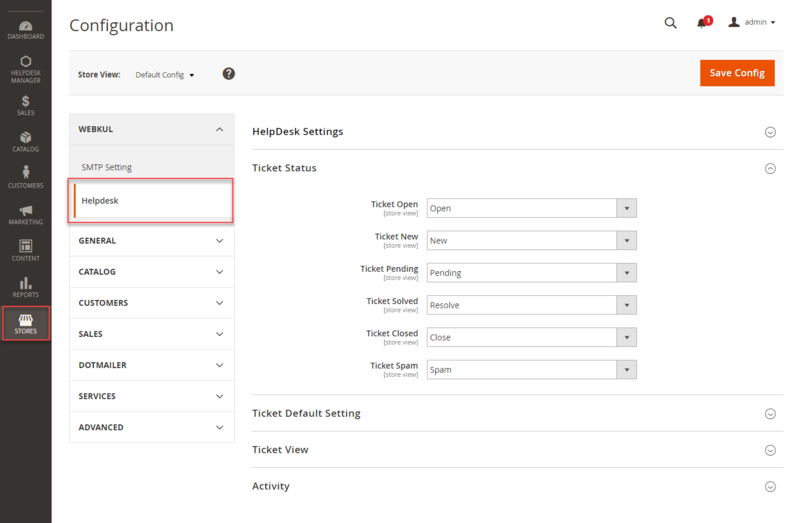 Events: select an event for which you want to trigger an action in response in the helpdesk system. At least one condition for events & trigger to apply: select conditions for the action to be executed. This is based on “OR Operator” concept means at least one condition needs to be met to trigger the action. All condition for events & triggers: select conditions for the action to be executed. This is based on “AND Operator” concept means all the conditions need to be met to trigger the action. Action: define the various action which will get executed when the specified condition meets. And lastly, click on Save button to create the new Event & Trigger successfully. In the single event, only one condition type will work at a time either At least one condition for events & trigger or All condition for events & trigger. In the single event, if both the conditions are defined. Then, it will first check the At least one condition type and if met, it will execute the action. And if not met, it will then check the All condition type. The admin has made an event – reply over the ticket as per the below image. This is will trigger the action and the customers will get notified about the reply in their mailbox. The agent can manage and add the multiple responses. View the complete list of the existing responses. Edit any response details by clicking on Edit link. Delete any response from the Action drop-down list. Add response by clicking on the Add Response button. For adding the new response, the agent will click on the Add Response button. This will navigate the agent to the “Add Response” page as per the below image. Name: enter the name of the response. Description: enter the description of the response. Can Use: specify who all can use this response. Status: set the status as enable/disable of the response. After configuring the basic details of the response, the agent will define the action which will be implemented as a response. Select the action from the drop-down list i.e by using this response what action will be performed in the ticket. For example, the agent has created a response say “Update Status” for which defined the action “set priority as high”. Then by choosing that response at “edit ticket” page, it will work as per the configured action. Can even add multiple actions by clicking on Add Action button. Also, add variables in the actions by clicking on Insert Variable button. And lastly, click on Save button to create the new Response successfully. Under this section, the agent can manage the multiple tags used in the ticket. View the complete list of the tags the agent has used or created in the ticket. Delete the tags from the Action drop-down list. If a tag is deleted from here, then that tag will get removed automatically from the ticket it was used. It will no longer be visible in the ticket. The agent must make a Service Level Agreement (SLA) policies to create targets for the tickets which need more attention and need to be resolved as soon as possible. 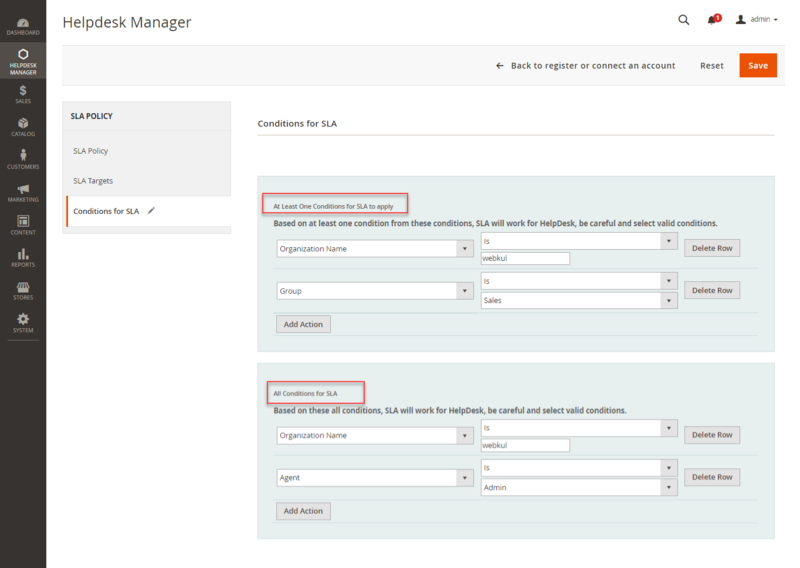 For this, the agent can manage and add multiple SLA policies. View the complete list of the existing SLA. Edit any SLA policy details by clicking on Edit link. Delete any SLA policy from the Action drop-down list. Add SLA policy by clicking on the Add Item button. SLA policies will specify when the customers can expect a response and resolution from you after submitting the support request. It lets you set the standards of performance the support team will deliver. Also, can set SLA policies for the time within which agents should respond and resolve tickets. And can even define automatic escalation rules to notify concerned agents about SLA violations. For adding the new SLA policy, the agent will click on the Add Item button. This will navigate the agent to the “Add Event” page as per the below image. Name: enter the name of the policy. Description: enter the description of the policy. Sort Order: specify the sort order of the policy. After configuring the basic details of the SLA policy, the agent will define the SLA targets. Here, the agents can make the targets for the SLA. And set the respond and resolve time for the ticket based on ticket priority. So that specific time limit will be set for every type of tickets. After defining the targets, the agent will set the conditions for the SLA. At least one condition for SLA to apply: select conditions for the action to be executed. This is based on “OR Operator” concept means at least one condition needs to be met to trigger the action. All condition for SLA: select conditions for the action to be executed. This is based on “AND Operator” concept means all the conditions need to be met to trigger the action. And lastly, click on Save button to create the new SLA policy successfully. In the single SLA policy, only one condition type will work at a time either At least one condition for SLA or All condition for SLA. In the single SLA policy, if both the conditions are defined. Then, it will first check the At least one condition type and if met, it will execute the action. And if not met, it will then check the All condition type. In this, the agent will manage the information for the customer so that commonly asked queries can be solved without creating a ticket. The agent can manage and create the multiple support center. View the complete list of the existing support center. Edit any support center details by clicking on Edit link. Update Status or Delete any support center from the Action drop-down list. Add new support center by clicking on the Add Item button. For adding the new support center, the agent will click on the Add GroupItem button. This will navigate the agent to the “Add Support Center” page as per the below image. In the support center, the agent will create some predefined questions and their answers. So that whenever a customer has a query or needs a support, they will read the solutions from these support center templates. Support Center Name: enter the name of the support center. Description: enter the description of the support center. CMS Page: select the CMS pages where this information will be displayed. Status: set the status as enable/disable of the support center. 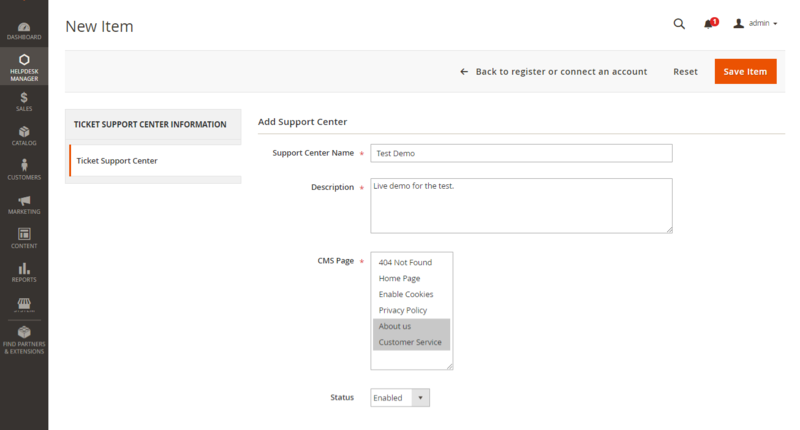 And lastly, click on Save button to create the new support center successfully. 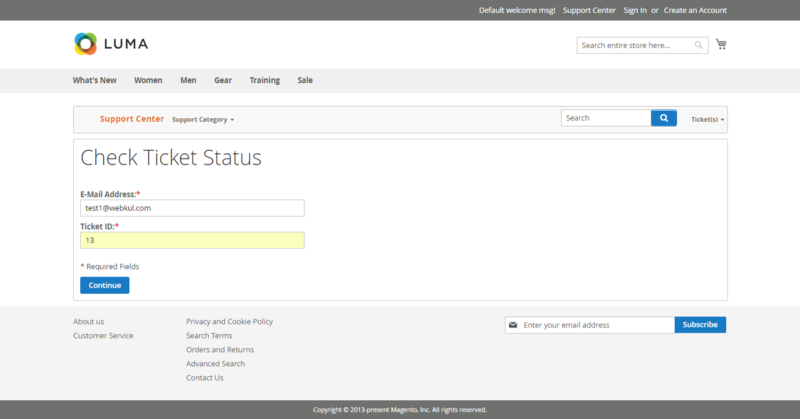 The agent can manage and add multiple email templates which can be used in the helpdesk system. View the complete list of the existing mail templates. Edit any mail template details by clicking on Edit link. Preview any mail template by clicking on Preview link. Add new template by clicking on the Add New Template button. For adding the new template, the agent will click on the Add New Template button. This will navigate the agent to the “Template Information” page as per the below image. Template Name: enter the name of the template. Template Subject: enter the subject of the mail. Template Content: enter the content of the mail. 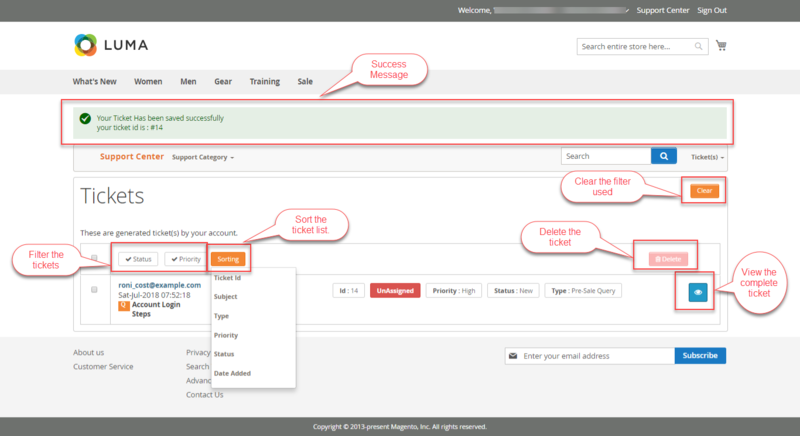 And can even insert mail keywords in the subject and body of the mail template by clicking on Insert Variable button. Template Styles: add style to display the template. And lastly, click on Save button to create the new mail template successfully. Email is a medium for customers to submit tickets to the Helpdesk and have conversations with agents to resolve their issues. In the helpdesk system, the agent can even connect mail. 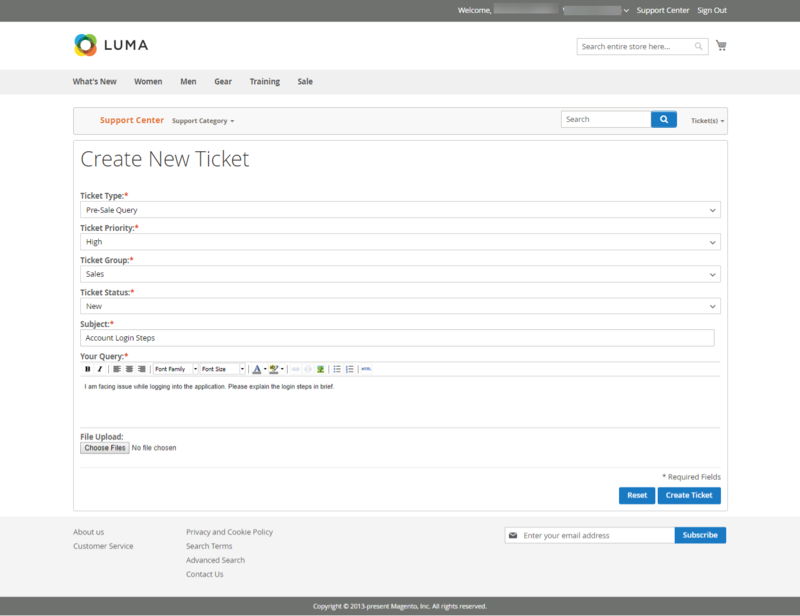 For example: when a customer sends a mail to an email address, a ticket gets created in the Helpdesk System automatically. Or if an agent updates the ticket, a notification email is sent to the customer automatically from the configured email id. Webkul helpdesk system is one and only helpdesk system in the world provides email piping feature that means your customer can reply directly from their email and they don’t need to login to the ticket system. View the complete list of the connect mails. Update Status or Delete any connect mail by clicking on Action drop-down list. Edit any connect mail by clicking on Edit link. Add new connect mail by clicking on the Add Item button. For adding the new connect mail, the agent will click on the Add Item button. This will navigate the agent to the “Connect Mail Information” page as per the below image. Name: enter the name of the mail. Description: enter the subject mail. Email: enter the email id which will be configured further for Email piping. Status: set status as enable/disable of the mail. Username: enter the username of the email. For example- Your full email address (username@gmail.com). Password: enter the password of the above account. Host Name: enter the hostname of your mail provider. Port: enter the port number of the email. Mailbox: enter the name of the mailbox. Protocol: select the protocol which you want to select – IMAP/POP.POP and IMAP are protocols which allow you to download messages from (Gmail, Yahoo, Hotmail) servers onto your computer. So that you can access your mail with the program like Microsoft Outlook or Thunderbird even when you aren’t connected to the Internet. Fetch Email(no. ): set no. of emails to be fetched. Helpdesk Action: set the action to be taken for the fetched emails. Move Email(s): define the name of the folder if the selected action for Helpdesk Action is Create Folder. Note: This information has to be filled to configure the Email piping. Select enable POP for all mail or enable POP for mail that arrives from now on. Choose what to do with your messages after your POP client or device receives them. 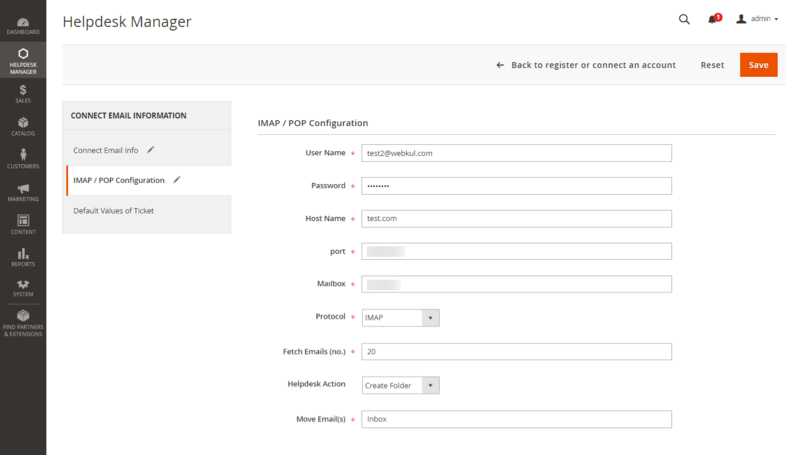 For configuring the IMAP and POP. Then, the agent needs to set the default values(group, type, and priority) for those tickets which are created through emails. And lastly, click on Save button to create the new connect mail successfully. After saving the connect mail successfully, the agent can view a new option Fetch Mail as per the below screenshot. The agent can click Fetch Mail option to fetch mails manually. Else can set the cron to automatically fetch the mails. Under this section, an activity list will be displayed. The list will show all the activities performed in the helpdesk so the agent can see all activities. And can even delete various activities from the list by clicking on the Action drop-down list. Under this section, the customer report is displayed. The customer report is the summary of the customer’s total ticket, resolve time, first response time, average resolve time is displayed. Under this section, the agent report is displayed. The agent report is the summary of the agent’s total ticket, resolve time, first response time, average resolve time is displayed. 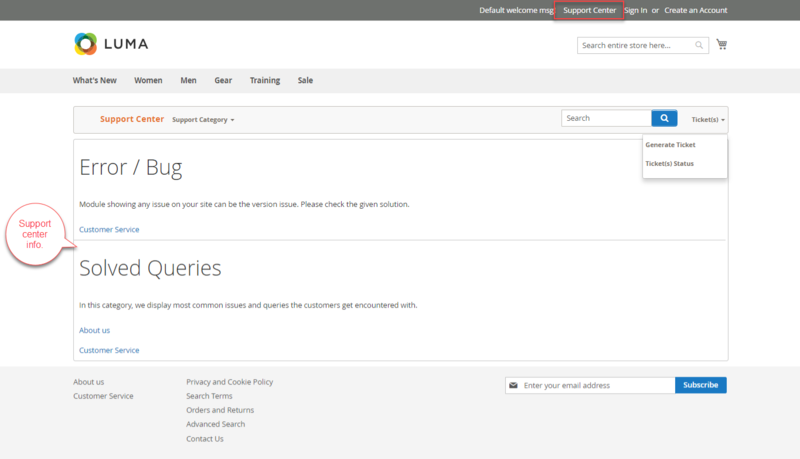 In this frontend, the customer can see the Support Center section. 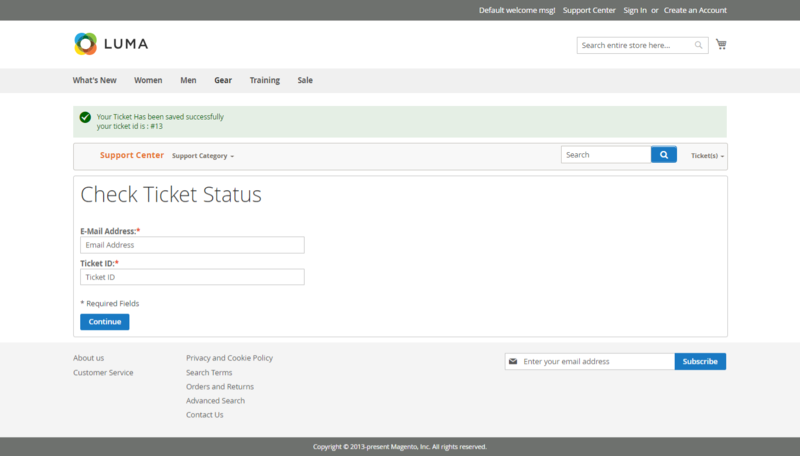 After logging into the account, the logged in customers can see the Support Center section. Clicking the Support Center section will display the solutions of the most common queries and issues the customers get encountered with so that they don’t need to generate any ticket. And if the customer doesn’t find the solution to their queries from the support center, they can generate the ticket. For this, they simply click the Ticket(s) drop-down list followed by clicking the Generate Ticket submenu option. Clicking the Generate Ticket submenu option will navigate the customers to a page where they can create the ticket as per below image. Ticket Type: select the ticket type. Ticket Priority: select the ticket priority. Ticket Group: select the ticket group. Ticket Status: select the ticket status. Subject: select the subject of the query. Your Query: enter the complete query. File Upload: upload the attachments if required. And lastly hit the Create Ticket button to generate the ticket successfully. This will navigate the customer to the tickets list page as per the below image. Sort the ticket list based on ticket id, subject, type, priority, status, and date added. Filter the ticket based on priority and status. Delete the tickets as per the choice. View the complete details of the ticket and their status. To view the complete ticket, click the view button. Here, the customer can view the complete details of the tickets. And can even delete the ticket threads if allowed from the admin backend. To navigate to the ticket list page to view the ticket status simply click on the Ticket(s) drop-down list followed by clicking the Generate Ticket submenu option as per the below image. Clicking the Ticket(s) Status submenu option will navigate the customers to a page where they can check the ticket status as per below image. 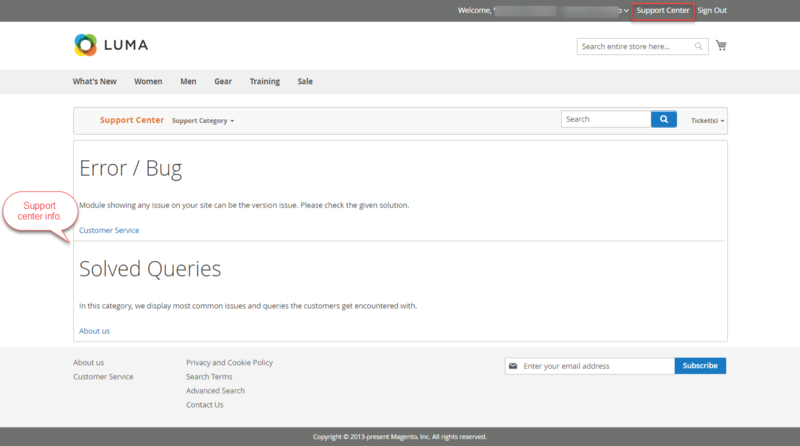 The guest users can see the Support Center section. This will display the solutions of the most common queries and issues the customers get encountered with so that they don’t need to generate any ticket. Email Address: enter the email address at which the customer will be notified about the ticket activities. And lastly hit the Create Ticket button to generate the ticket successfully. This will display the success message with the ticket id as per the below image. After creating the ticket, the customers can even check their ticket status by feeding the email address which they have provided while creating the ticket and the ticket id followed by hitting the Continue button. The customers can also check the status of their previously created tickets. For this, they simply click the Ticket(s) drop-down list followed by clicking the Ticket(s) Status submenu option. Here, the customers will feed the email address which they have provided while creating the ticket and the ticket id followed by hitting the Continue button. 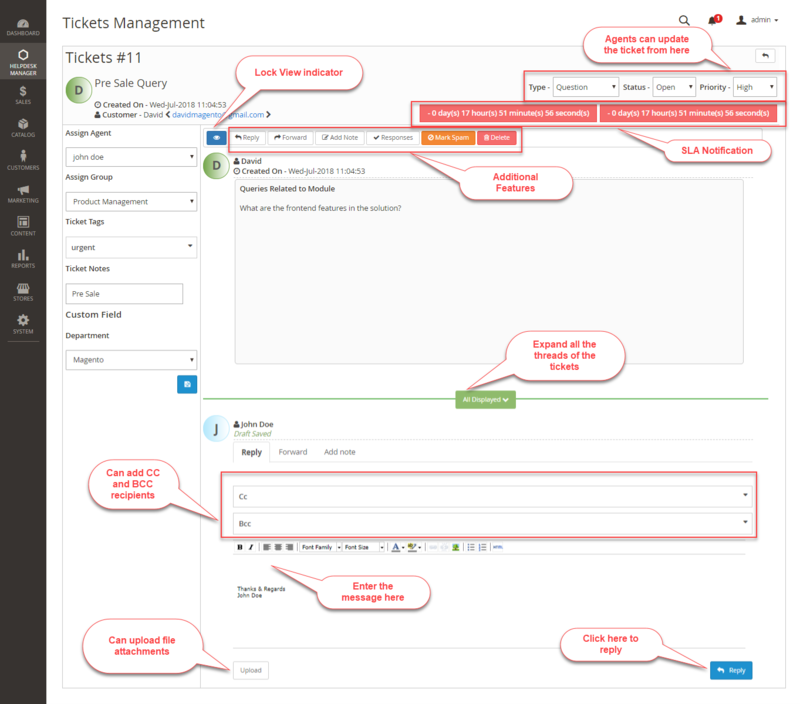 This will display the helpdesk ticket view screen as per the below image. Here the customer can reply to the ticket and can also see the previous replies.